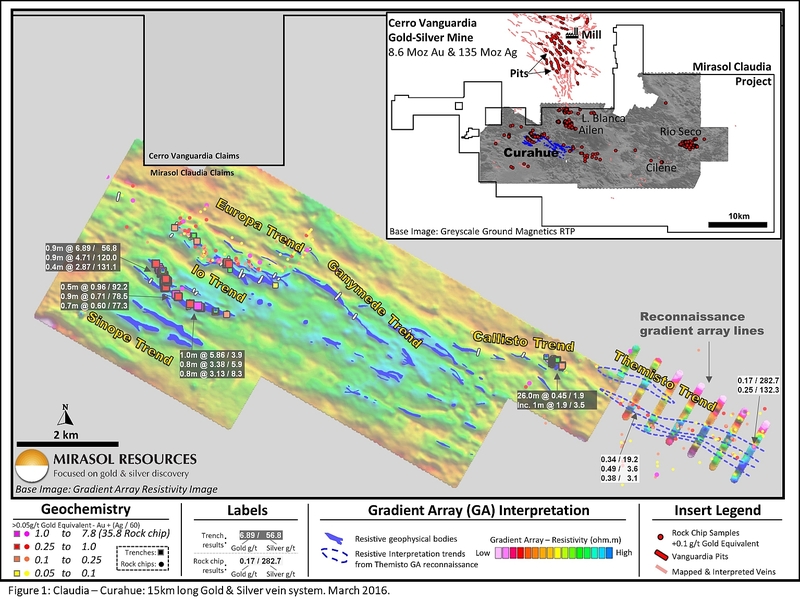 VANCOUVER, BC, March 1st, 2016 — Mirasol Resources Ltd. (TSX-V: MRZ, Frankfurt: M8R) (the “Company“) is pleased to announce that the Company, and one if its 100% owned Argentine subsidiaries, have signed an Exploration and Option Agreement dated February 29th, 2016 (the “Agreement“) with Cerro Vanguardia S.A. (“CVSA“) to explore the Company’s Claudia gold silver project in Santa Cruz province Argentina. CVSA has been granted the option to acquire, up to a 75% interest in the Claudia Project, exercisable in 3 stages over a six year or shorter earn-in period. CVSA operates the multi-million ounce Cerro Vanguardia gold and silver mine which abuts Mirasol’s 127,680 ha Claudia project containing a series of large scale gold silver prospects (Figure 1; see news release 28th July 2015 and 4th March 2013 and Claudia Project summary on the Mirasol website Mirasol Claudia Presentation) which are within reasonable trucking distance to the Cerro Vanguardia mill and processing facilities. Cerro Vanguardia S.A. is 92.5 % owned by AngloGold Ashanti, the controlling shareholder, and 7.5 % by Fomicruz S.E., the Santa Cruz provincial mining company. The mine produced 300 thousand ounces of gold in 2015 and over 1.25Moz in the last five years, mining from a series of open pits, heap leach and underground operations. Cerro Vanguardia is one of AngloGold Ashanti’s lower cost gold producers with an all in sustaining cost, in 2015, of USD 873/oz (AngloGold Ashanti Q4-2015 report) with total district resources and past production of 8.6 Moz Au and 135 Moz Ag. The first phase of the Claudia — CVSA Agreement entitles CVSA to earn a 51% interest in the project over a maximum 2-year period, by spending USD 5 million on exploration, making USD 1 million in payments to Mirasol and executing an exploration program that includes a minimum of 12,000 meters of drilling. The first year commitment by CVSA includes a cash payment of USD 100,000, to Mirasol, a minimum exploration expenditure of USD 2 million with an exploration commitment including 6,000 meters of drilling focused on the Curahue prospect, and USD 200,000 in geophysical surveys. CVSA can elect to proceed to a second stage of the 51% earn-in by making a second payment to Mirasol of USD300,000, spending another USD 3 million dollars on exploration including an additional 6,000 meters of drilling. Following this investment, CVSA can exercise the 51% earn-in by making a final cash payment of USD$ 600,000 to Mirasol. CVSA may elect to earn-in to 65% of the Claudia project within an additional two (2) years of the 51% earn-in by delivering a preliminary economic assessment with a NI 43-101 compliant resource of not less than 350,000 oz gold in the Inferred, or higher, resource classification, with grades that support profitable economic extraction based upon the Cerro Vanguardia Mine cost structure. In the event that CVSA does not complete the 65% earn-in, the interests of the parties shall be adjusted such that the Company shall hold a 51% interest and CVSA shall hold a 49% interest in the Claudia project. less than 350,000 oz of gold including a minimum of 175,000 ounces of Measured mineral resources; and delivering to the Company a decision to proceed with mining operations on the resources defined. At any time after CVSA has earned a 75% interest, Mirasol shall have the right to require CVSA to provide a loan on commercially reasonable terms, to fund 100% of Mirasol’s share of the costs to commence commercial production, with repayment of the loan to be made from 60% of the Company’s cash flow from production. Stephen Nano, the CEO of the Company, stated that he is very pleased to have partnered with a strong company such as CVSA, who has committed significant resources to explore the compelling targets identified by Mirasol at Claudia. Mr. Nano further commented, that if exploration delivers success the Claudia-CVSA agreement is structured to provide a direct path to development and production from Claudia as a satellite to the existing Cerro Vanguardia Gold Mine. Further exploration updates will be provided by the Company as exploration advances on the Claudia Project. Mirasol is a project generation company focused on exploring the exploration and acquisition of, precious metals and copper prospects in the Americas. Strategic joint ventures with producers have enabled Mirasol to advance its priority projects, focused in high-potential regions in Chile and Argentina. Mirasol employs an integrated generative and on ground exploration approach combining leading edge technologies and experienced exploration geoscientists to maximize the potential for discovery. Mirasol is in a strong financial position and has a significant portfolio of exploration projects located in Chile and Argentina. Exploration at the Claudia Project was supervised by Stephen C. Nano, then the Vice President of Exploration who is the Qualified Person under NI 43-101 for the surface exploration and drilling at the project. All technical information for the Claudia project was obtained and reported under a formal quality assurance and quality control (QA/QC) program. Drill core, rock channel and rock chip samples were collected under the supervision of Company geologists in accordance with standard industry practice. Samples were dispatched via commercial transport to an ISO 9001:2000-accredited laboratory in Argentina for analysis. Results of this exploration program have been monitored via the Company’s QA/QC process/procedures and laboratory performance met required standards. Assay results from diamond drill core samples may be higher, lower or similar to results obtained from surface samples due to surficial oxidation and enrichment processes or due to natural geological grade variations in the primary mineralization. Forward Looking Statements: The above contains forward looking statements that are subject to a number of known and unknown risks, uncertainties and other factors that may cause actual results to differ materially from those anticipated in our forward looking statements. Factors that could cause such differences include: changes in world commodity markets, equity markets, costs and supply of materials relevant to the mining industry, change in government and changes to regulations affecting the mining industry. Forward-looking statements in this release include statements regarding future exploration programs, operation plans, geological interpretations, mineral tenure issues and mineral recovery processes. Although we believe the expectations reflected in our forward looking statements are reasonable, results may vary, and we cannot guarantee future results, levels of activity, performance or achievements.